No, I'm not talking about the Book of Genesis from the Bible. 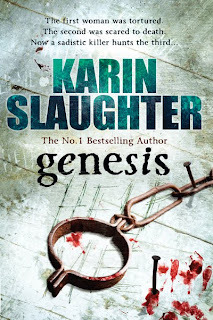 I'm talking about Genesis, the new thriller from Karin Slaughter. I picked this up in Big W a couple of weeks ago after having finished my first Slaughter-novel a few weeks earlier. I quite liked the protagonists of Fractured, the first one I read so I thought I'd give another one a go. doctor in Atlanta's Grady Hospital she is starting to piece her life together. The story opens with an elderly couple driving along a back-road at dusk. They hit what they think is a deer, but what in actual fact is a naked and brutalised woman. The woman is rushed to Grady Hospital, and Special Agent Will Trent just happens to be cooling his heels while he waits for his partner, Faith, who has also been taken to hospital after fainting. Will sees the woman arrive and knows straight-away that this is way more than just a typical pedestrian vs automobile accident. The thing I like about Special Agent Will Trent is that he has a unique disability. Unique in that I have never read another book where the main character and chief sleuth is illiterate. Having been bought up in an orphanage from the age of 5 months (he was found in a trash-can after his mother was murdered and she tried to hide him) he was shunted from state care to foster families and back, returning to the orphanage each time with yet more injuries from his 'carers'. Will overcomes this disability in a number of different ways, but it's always a constant struggle to keep it a secret. Only his hard-assed boss Amanda, and his partner Faith Mitchell are aware. Faith, on the other hand has her own problems. Pregnant at age 14, she now finds her self at 32 with an 18-year-old son who's in his first year of Uni. Having overcome that hurdle to work her way through the local police ranks, and then to the Georgia Bureau of Investigation, she now finds herself pregnant yet again, and a diabetic to boot. Juggling all these personal trials, Agents Trent and Mitchell set out to find a sadistic murderer, with a penchant for using plastic garbage bags in a way the manufacturer definitely did NOT intend (let's just say, it's pretty gross, and I thought I'd read pretty gross before!). I usually judge crime fiction on how soon I guess the murderer. I guessed the murderer about 3 quarters of the way through, although just after I thought I'd figured it out my suspicions were confirmed by a very obvious clue. I also quite liked one of the more minor players, Dr Sara Linton. I realised after I finished reading Genesis that Sara Linton is the protagonist in a number of other novels Slaughter has written. I think I just might check out on of the others featuring Sara to see what they're like. Stay tuned for the verdict! If you like crime fiction then I definitely recommend grabbing this one. With a enough pace and suspense to keep you turning the page, Slaughter tells a sick tale with a slick cast of characters. Hi! After you mentioned this author a while back I stumbled across one at a second hand shop, it was Indelible. It was a good read but it did talk about some stuff that must have happened in earlier books. I think I'll have to track some of them down now as well. That's for talking about her books, I'm a picky crime reader, but this was great!! Not a problem, glad you found a good read. I'm keen to read a few of the older ones too. Just found out my step-mum is a fan and has read them all, so I may have to see if she still has them so I can borrow them!